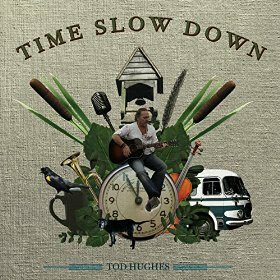 Canadian roots-rock songwriter Tod Hughes has released his new album Time Slow Down. The flicky and fun title track opens with Hughes featuring a strong female backing vocalist in the singable chorus with a fiddle lead; it’s a nice, positive, simple, funky, folk-rock opener. “Nothing to Obscure” is a sweet acoustic tune, with mainly Hughes’ delicate, slightly sad vocals, and sweet fiddle, electric, and drums slowly slipping in behind him as the song opens up in some very solid, lyrical, subtle ways; it’s a wonderful tune. “Drinking Coffee in a Hipster Place” is a heavy percussion tune, with fun, slightly wry spoken lyrics, those backing female vocals again, and clean guitar lead slipping around, while a horn beats in the background. It’s wacky, wild stuff to be sure. “Real You and Me” is a nice, quick love song, again featuring the fiddle and backing vocals. One needs to listen a little deeper to Hughes’ lyrics here (as well as every other place on Time Slow Down). His seemingly oft-mined light-hearted sensibility is not all it seems. “Darkness That Cries” ends the album and it is a killer, really. Hughes croaks the lyrics out, talks some of it, strumming slowly before we get the big folk-country, commercial chorus. This is an expansive tune, if not in production, in lyrics and intent, just as on-par with classic country songwriting and delivery. It’s a wonderful end to a very good album indeed.